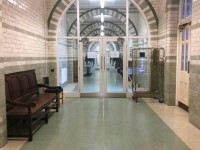 Services / facilities within the building include a conservatory, legal services, research & business services, the building manager and the chapel (Foresight Centre). Related link Waterhouse Building Block A. Related link Waterhouse Building Block B. Related link Waterhouse Building Block D.
Waterhouse Building Block C is internally linked to Waterhouse Building Block D via the ground, first and second floors. 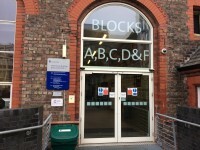 Waterhouse Building Block C is internally linked to Waterhouse Building Blocks A & B via the first floor. 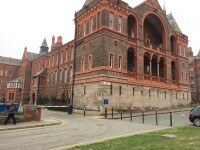 This venue is situated in North Campus. 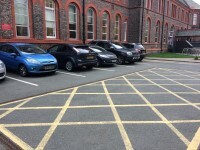 The dimensions of the Blue Badge parking bay(s) are 270cm x 480cm (8ft 10in x 15ft 9in). 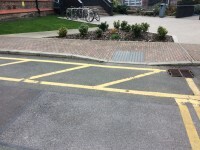 The furthest Blue Badge bay is 23m (25yd 6in) from the main entrance. 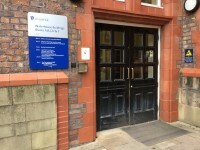 You are on Outside Access (Block D). Skip to the next section. 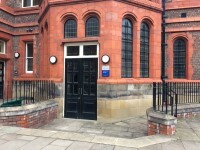 You are on Outside Access (Access to The Chapel (Foresight Centre)). Skip to the next section. This information is for the entrance located next to the main entrance. 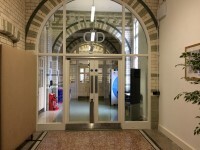 The reception desk is 2m (6ft 7in) from the main entrance. The dimensions of the lift are 100cm x 204cm (3ft 3in x 6ft 8in). There is no additional signage on or near the toilet door. 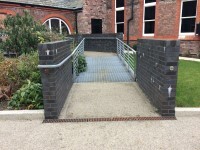 The accessible toilet is 48m (52yd) from the lift. 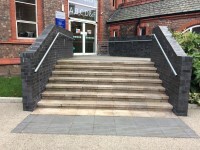 The accessible toilet is located on the second floor. The dimensions of the accessible toilet are 155cm x 250cm (5ft 1in x 8ft 2in). 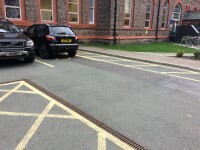 The lateral transfer space is 180cm (5ft 11in). There are not mirrors in the accessible toilet. The hand dryer is 102cm (3ft 4in) high. The female and male toilets are 48m (52yd) from the lift.